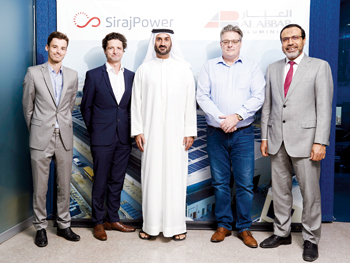 SirajPower, a Dubai-based joint venture devoted to net metering and providing comprehensive turnkey solutions around solar rooftops in the UAE, has signed a new partnership with Al Abbar Aluminium, a leading family-run GCC façade company. SirajPower will deliver almost 1 MW of solar energy and help Al Abbar Aluminium save nearly 40 per cent of its expected power consumption at its new steel and aluminium facility in Jebel Ali. The signing ceremony took place at Al Abbar Aluminium Jebel Ali headquarters with the attendance of Mohammed Abdulghaffar Hussain, chairman; David Auriau and Laurent Longuet, directors at SirajPower; James Dickson, Al Abbar Group CEO; and Ahmed Rashid, Al Abbar Aluminium commercial manager. This partnership falls within Shams Dubai, Dubai Electricity and Water Authority’s (Dewa) first smart initiative, which aims at connecting solar energy and supporting the diversification of the energy mix by promoting the use of clean renewable energy sources. SirajPower has inked a 20-year lease agreement with Al Abbar Aluminium to finance, build and operate the system while delivering energy at a more competitive price, said a statement. The new partnership also strengthens SirajPower’s presence in Dubai. Since the beginning of its operations in the emirate in 2016, the company has secured a number of large and prestigious projects. SirajPower has set out to finance 50 MW of solar rooftop projects for 2018 in Dubai as part of Shams Dubai. It is also currently the only company offering a full range of activities under the same umbrella, which are related to solar net-metering since the company is licensed and Dewa-certified to offer engineering, procurement, construction (EPC) solutions and licensed to offer leasing solutions, it said.